North Korea October Tour - If you are travelling around China during this time of the year and would like to have a break on the golden week, this is a great chance. The application deadline for this trip is September 1st. If you apply after the application deadline we will be able to notify you within 24 hours if your transportation means can be booked on time. This trip will also allow you escape a busy week in China. If you may need us to arrange any trips or accommodation in China please do let us know as we offer trips all over the Middle Kingdom. It is possible for non-US travellers to enter by train. Please contact us if interested in this option. Moran Park - tends to be busy with locals on Sundays and holidays. Do not be surprised if you are asked to join in any dances that may be taking place! Mansudae Art Studio - see where DPRK paintings, statues and propaganda posters are produced. You will be able to meet the artists while they work and it is possible too to purchase artwork. Check-in: Minsok Hotel - The folk hotel is a traditional courtyard hotel located in the old part of Kaesong. Given that there is a clear night, which should be the case this time of year, walking around the premises at night allow you to see countless stars which is a stark contrast to the skies from Seoul only just 70 KM south (you can see the difference from Kaesong as you look south). The statue of President Kim Il Sung can also be seen from the courtyard hotel. Dinner: Minsok Hotel. If you would like to try some dog soup this is optional (€5) as is the ginseng stuffed chicken (€30, one chicken serves two people). Please let us know beforehand if interested in the chicken a few hours before our arrival to Kaesong as it will have to be prepared beforehand. Tomb of King Kongmin and his Mongolian wife. We will see tombs of generals on the way there too. These tombs have undergone very little restoration and therefore remain close to their original state. 38th Parallel (DMZ) - chance to enter the famous blue negotiation rooms where talks between North & South Korea have taken place. 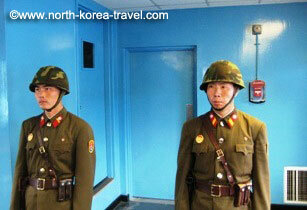 We will tour Panmunjom, always escorted by KPA soldiers as is mandatory. We will see where the Korean War Armistice was signed. The KPA soldiers tend to be keen on seeing what travellers views on the Korean War and the Korean peninsula are and a visit here presents us with a unique chance to interact with North Korean soldiers. Koryo Museum, Kaesong - we head to the city of Kaesong which was not destroyed by the Korean War and boasts an old part of town, to visit what initially was a university during the Koryo dynasty. We will be explained what life was like in Korea in the medieval ages. Kaesong Stamp Shop - chance to purchase stamps, postcards (you can actually send these from North Korea to your home country) and artwork. Lunch: Tongil Restaurant - reunification restaurant. You will be served 12 different dishes in covered up golden plated small bowls. 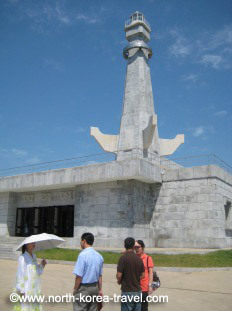 Victorious Fatherland Liberation War Museum - see the North Korean version of the Korean War. This museum exhibits original weapons and vehicles used during the first Cold War conflict. It was moved to a much bigger building in 2013 and is now a truly impressive and detailed museum fully explaining the DPRK version of the Korean War. International Friendship Exhibition Centre - see where thousands of gifts have been presented to the Leaders Kim Il Sung, Kim Jong Il and Mother Kim Jong Suk (wife and mother of Kim Il Sung and Kim Jong Il respectively). There is now too a new section for the Leader Kim Jong Un. Local evening funfair - we ask for a visit here to be arranged not so much for the rides (which are great fun!) 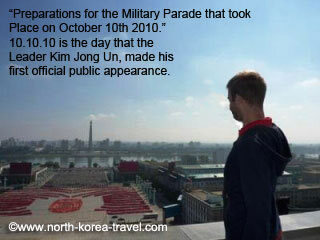 but more so because it is a great chance to mingle with North Koreans. If you decide to take a ride rates vary from 1.5 to 5 Euros per ride. Pyongyang Film Studios - see where movies in North Korea are filmed. If lucky we might see a movie being filmed! National Embroidery Institute - absolutely stunning artworks are produced here. We'll be able to see the workshops where these are produced while the workers are making them. You can also purchase sewn pictures. The other interesting aspect of the embroidery institute is that is right by the Ryugyong Hotel and it is then when you realise how gigantic this building is! Drive to the port city of Nampo located on the west coast of the DPRK. We will drive on the Youth Hero Highway, a highway built by university students at the end of 1990s. Some of the guides that we have now worked with for many years were actually involved in helping construct the highway. 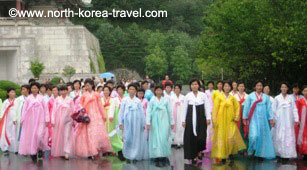 We believe that knowing the local guides as well as their personal stories and views on life in North Korea as well as on the rest of the world are a vital part of the trip and truly believe that our long lasting and trusting relationship with our Korean partners as well as our small groups help this to be attainable. Please go to our North Korea Tourism page to see more information on other tours that we offer other than our North Korea October Tour.